Sergio Leone “spaghetti westerns” did not simply add a new chapter to the genre…they reinvented it. From his shockingly violent and stylized breakthrough, A Fistful of Dollars, to the film Quentin Tarantino calls “the best-directed movie of all time,” The Good, the Bad and the Ugly, Leone’s vision did for westerns what talkies did for all movies back in the 1920s: it elevated them to an entirely new art form. Fully restored, presented in high definition with their best-ever audio, and including audio commentaries, featurettes and more, these films are much more than the definitive Leone collection...they are the most ambitious and influential westerns ever made. 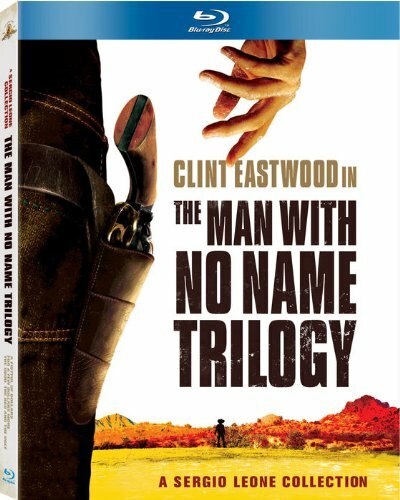 Clint Eastwood’s legendary “Man With No Name” makes his powerful debut in this thrilling, action-packed classic in which he manipulates two rival bands of smugglers and sets in motion a plan to destroy both in a series of brilliantly orchestrated setups, showdowns and deadly confrontations. Oscar® Winner Clint Eastwood** continues his trademark role in this second installment of the trilogy, this time squaring off with Indio, the territory’s most treacherous bandit. But his ruthless rival, Colonel Mortimer (Lee Van Cleef, High Noon), is determined to bring Indio in first...dead or alive! The invincible “Man With No Name” (Eastwood) aligns himself with two gunslingers (Lee Van Cleef and Eli Wallach) to pursue a fortune in stolen gold. But teamwork doesn’t come naturally to such strong-willed outlaws, and they soon discover that their greatest challenge may be to stay focused – and stay alive – in a country ravaged by war.